Glasgow Disability Alliance Chief Executive Officer, the most senior decision maker who reports directly to the Board, has endorsed these pledges and has made a commitment to the Charter principles. These were reported to the meeting of GDA’s Board of Directors on Thursday 10 November 2016. The Board of Directors has agreed an action plan to meet GDA’s pledges. As a result – and with the publication of their Census baseline data – GDA have obtained the right to use the Charter Mark. 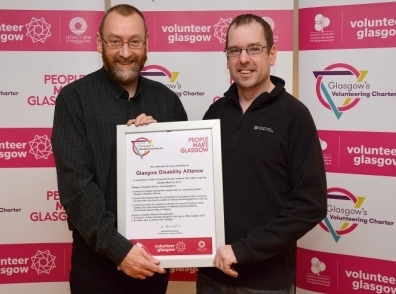 As one of the first five organisations to do so, Brian and Steven from GDA collected their Charter Mark certificate from Volunteer Glasgow on 27th January 2017 (pictured below).